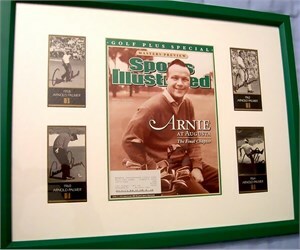 1958, 1960, 1962 and 1964 Masters Champion cards (representing all four of his victories at Augusta), each individually autographed in black marker by the legendary Arnold Palmer, professionally matted and framed with the Arnie at Augusta Sports Illustrated Golf Plus cover issued when he said goodbye to The Masters in 2004. Obtained in person at the Bob Hope Chrysler Classic golf tournament many years ago. With certificate of authenticity from AutographsForSale.com. Ready to hang. ONLY ONE AVAILABLE FOR SALE.